The first edition of the Pevsner architectural guide to Northumberland, published in 1957, talked of Edlingham Castle as "no more than the ordinary tower house." Opinions changed following archaeological excavation in the years between 1978 and 1982. 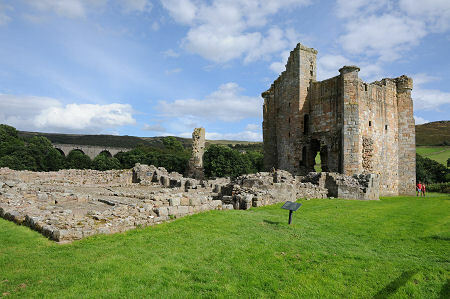 What was previously a jumble of grassy mounds to the north of the visible tower was cleared of up to 2m of earth, to reveal the story of a remarkable castle that charts the course of three centuries of war and peace in a corner of Northumberland that lies only 15 miles from the closest part of Scotland. Edlingham Castle stands in the valley of the Edlingham Burn some five miles south east of Alnwick, and just to the east of the tiny hamlet of Edlingham. To reach it you park on the broad verge beside a signposted lane. A gate at the foot of the lane, close to the Norman Church of St John the Baptist gives access to a broad grassy path, which leads the 300 yards or so gently downhill to the ruins of the castle. It is worth pausing en route to appreciate the castle set against the backdrop of the railway viaduct to the north east. The viaduct formed part of the Cornhill Branch Railway from Alnwick to Cornhill-on-Tweed, which opened in 1887, and closed in 1953. As you approach, the main standing structure, the solar tower, is to the right hand end of the castle, with the remainder of the castle laid out to its north and to your left. You can, of course, explore the elements of the castle in any order you want, but an excellent starting point is the barbican, which formed the main entrance to the castle in the latter part of its active life. This lies at the left hand end of the complex. Access to the barbican is via a wooden footbridge, and as you cross it you realise that even the standing parts of Edlingham Castle suffer from structural issues. The most obvious is that the solar tower, at the far end of the castle, has cracked vertically from bottom to top at some point, leaving a substantial chunk of the structure leaning away from the rest of the tower at an angle that looks totally unsustainable. It is difficult to believe, but this part of the building, which looks as if it could collapse at any moment, has apparently been like this since the early 1600s. Supporting wires were added in the 1980s to prevent the lean getting worse. From the barbican and the gate tower beyond it, you pass into a cobbled courtyard area, with low walls showing the presence of ranges of buildings on both sides. At the far side of the courtyard you come to the slightly more significant ruins of the hall house which once occupied the whole of the south eastern side of the courtyard. 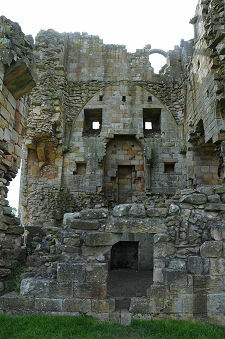 And beyond the hall house is the best surviving part of the castle, the solar tower. A solar, which can refer to either a room or a tower, is often used in English grand houses and castles to refer to the part of the accommodation used by the owner and his or her family as their private living and sleeping quarters. 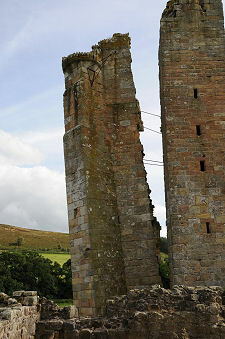 The quality of the workmanship used in the solar tower at Edlingham was very high, as can be seen from the surviving facing stone, carved heads and other decorative features within the tower today. That is, of course, if you can overcome the very natural fear of standing under such a large chunk of apparently unstable masonry, and get close enough to the solar tower to look at it in any detail. It is easier to appreciate what you are seeing at Edlingham Castle if you understand a little about how this rather unusual collection of structures came about. The starting point was in about 1250, when John de Edlingham built a stone hall house a little to the north west of the Edlingham Burn, within a moated enclosure. The hall house measured about 100ft by 30ft. The ground floor provided storage and services, plus accommodation for the lesser members of the entourage. There was an octagonal turret at each corner, one of which provided the only internal staircase between the main floors. The main access to the hall house was by means of an external staircase which led up to the grand hall on the first floor. This would have had a high ceiling, while the reminder of the upper part of the hall house was divided into two storeys of lower-ceilinged accommodation. Although there was a surrounding moat, the house built here in 1250 was more for comfort and show than for defence, reflecting the fairly stable and peaceful state of Anglo-Scottish relations at the time. This was not to last. 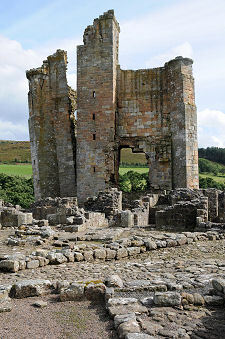 From 1296, Edlingham was in the hands of Sir William de Felton, Sheriff of Northumberland, and wider Anglo-Scottish relations were deteriorating rapidly. Sir William strengthened the defences of the site by erecting a wall, probably of wood, around the inside of the moat, and building a gatehouse at the north end of the site to control access. In about 1340 another Sir William de Felton, the son of the first, erected substantial stone curtain walls around the sides of the enclosure and built a much stronger gate tower in place of his father's gatehouse. There were probably wooden buildings within the enclosure at the time, but these were replaced by stone ranges as part of the 1340 upgrade. The other important change in 1340 was the building of the solar tower, intended to provide accommodation that was more secure and more comfortable than was available in the hall house. The solar tower stood 35ft square and rose to three storeys high. 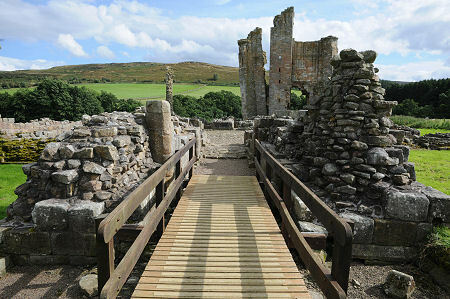 Access to it was via a two storey building linking the solar tower with the hall house. The final significant addition to the castle came in about 1400, when a barbican was built to further strengthen the gate tower. In 1519 the castle passed to the Swinburne family, and appears to have been used to house farm animals rather than members of the family. By the early 1600s some of the decisions taken in 1340 were also coming home to roost. Most importantly, it appears that the solar tower had been built over part of the original moat, and the resulting subsidence led to the partial collapse of the tower. When you look at it today, the real surprise is that the collapse wasn't more extensive. Meanwhile, it seems that the stone curtain wall built on the western side of the site in 1340 was too close to the moat, and at some point collapsed into it. The Swinburnes abandoned the castle in about 1650, and pretty much everything except for the solar tower appears to have been regarded as fair game for use as a quarry for building stone. As a result, the rest of the castle was reduced down to the level of low walls. As you look across to the 1880s railway viaduct it is difficult not to wonder how much of the stone that went into making it, which looks very similar to that still standing in the solar tower, came from the castle. We've already noted that by 1978 most of the site apart from the solar tower had been covered by up to 2m of earth. Since the excavations that took place over the following four years, the castle has been in the care of English Heritage.